Tess and her sister, Gaby are close. 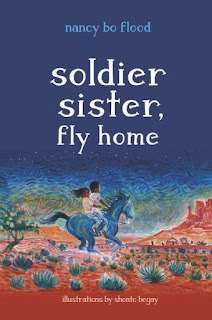 So when Tess moves from the reservation school to Flagstaff to finish junior high, she looks forward to spending time with her sister who is enrolled in the local college. Tess is hoping that a track scholarship will help her get to college. But things change. Gaby enlists and Tess misses her companionship. Gaby's best friend is killed in action right before Gaby is deployed to Iraq. 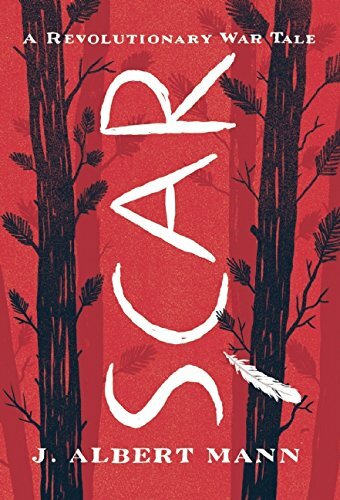 Tess is trying to figure out how to live in two worlds: that of the mostly white school she attends, and back home with her Diné family. She is also left with Gaby's horse, Blue, who she promises to care for but is afraid of. What I love about this book is the authentic writing. Nancy Bo Flood captures the sounds and smells of the desert: ravens whooshing overhead or "hunkered on limbs of a gnarly pinion tree like old men arguing politics." You can taste the air, feel the red sand in your shoes, and the heat of the desert sun beating down on your head. I love how Nancy brings us into the Navajo culture, sharing traditions and language. How Tess and her Grandfather collect a lamb for Gaby's Protection Ceremony meal, and soothe it, singing, so the lamb is calm and peaceful when Grandfather picks up his knife. I love how Nancy captures Tess, caught in two worlds. At school she is the "girl from the Rez" and accused of using "Navajo magic" to win at track. At home she is called an apple - red on the outside, white on the inside. 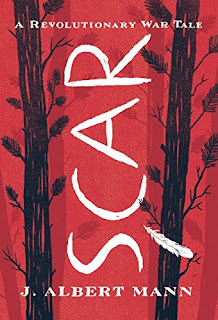 An incident at the trading post makes Tess think more deeply about what it means to be a "real Indian", and where home is when you are half white, half Navajo. 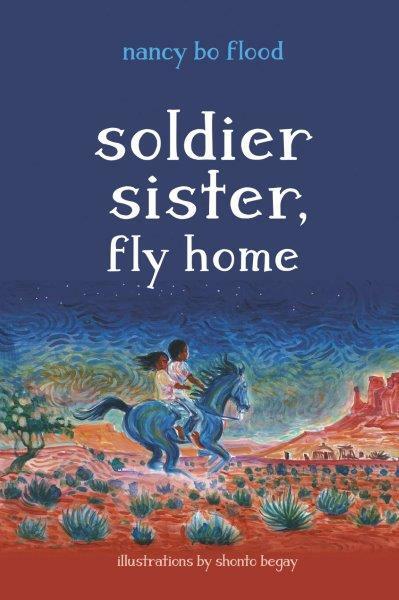 I love that Nancy includes back matter: information about the Navajo language and a glossary of words used in the book, as well as an acknowledgement of Lori Piestewa , a member of Hopi who is remembered as the first Native American woman in US history to die in combat on foreign soil while serving in the military. Check out this lovely tribute to Lori Piestewa (and pay attention to the song that is being sung). Writing about a culture other than your own isn't easy. Some people think that you shouldn't. Nancy shares her thoughts on writing about another culture on her blog. You can learn more about culture, traditions, and beliefs of the Diné here. You'll also find links to Code talkers (like Tess's grandfather). For a lesson in how to say the colors in Navajo language, check out this video. It's a hot July day in upstate New York in 1779. Noah is alone in the woods, except for a young Mohawk. They both lie wounded, after a bloody battle. At the age of 16, and despite his lame foot, Noah has taken on the work that would normally have fallen to his father. His father is gone - not to fight the British, but felled by disease. Then a Mohawk band storms their farm, burning everything. Noah and his family hide in the woods. When the villagers gather, they decide to track the Mohawks and fight, against the advice to wait for help to arrive from Washington's army. Noah volunteers and is paired with a doctor. The march is hard; the battle worse and their unit wiped out. Wounded, Noah tries to find help. That's when he discovers the wounded Mohawk warrior, whom he names "Scar". Noah bandages him and provides water and comfort through the night. Told in first person, the chapters alternate between July 22, the day of the Battle of Minisink, and earlier events leading to the battle. We discover that Noah has dreams of building a farm, and a girl to share those dreams with. This story brings to life a part of the Revolutionary War we don't hear much about and raises questions regarding what a hero is. Back matter includes information about the Mohawk chief Joseph Brant and the battle, along with biographical sketches of main characters who are real people. A bibliography provides additional reading for curious young historians. You can find more information about the battle at the Minisink Valley Historical Society. 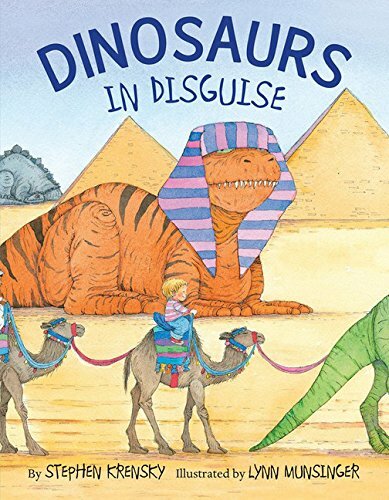 I love books about dinosaurs! The more the better - so I was ecstatic when two show up in my review basket. One afternoon, Joe and his sister Sally spotted a strange set of footprints. When Sally asks who made them, Joe is certain they are dinosaur footprints. The intrepid duo set out to follow them. They pass by the empty pet food dish. "It must be a very hungry dinosaur," said Sally. What I like about this book: you can almost hear the scary music building in the background as Sally and Joe follow footprints that indicate a hungry, heavy dinosaur. They follow clues that lead them to think the dino has been dancing, swimming... and then they decide to build a trap. Then they learn that hungry dinosaurs should be left alone. Author/illustrator Alex Latimer takes on dinosaurs in a fun way. You can see some of his artwork at his website, and read reviews of his previous books, Pig and Small and Lion vs Rabbit. Most people believe that dinosaurs are long gone. 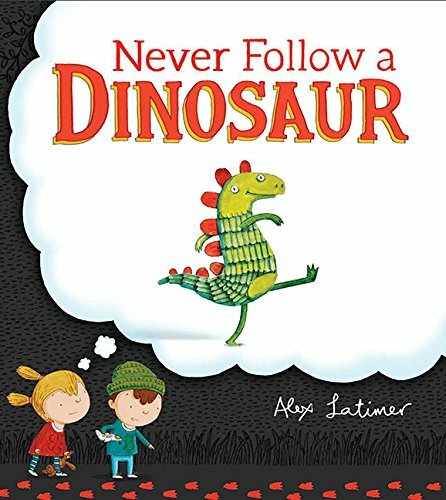 The young narrator of this tale is certain that the dinosaurs that ruled the earth for millions of years could have survived the impact of an asteroid. They're not extinct, just smart enough to stay hidden - especially once humans emerged on the planet. What I like about this book: the imaginative ways that dinosaurs could blend in to our modern world. "You can find them if you look hard enough," says the narrator - and he sees them everywhere, from traffic light supports to department store Santas. As he imagines dinos in the present era, he realizes that humans might have to clean up the place a bit before the dinos come out of hiding. Cut out some dinosaur footprints and create a trail for a friend to follow. Here's one way, and here's another. Check out these dinosaur footprints found in Australia just last month! You could also cut some dinosaur footprints into a potato and make potato-print trails ... perhaps a birthday card or a treasure map where footprints lead to the treasure. Find places dinosaurs might hide if they were in disguise. Are there places in your neighborhood? Could they be disguised as workers? Lamp posts? Draw a picture showing how you would hide if you were a dinosaur. Make a picnic and invite a dinosaur along. If you are wondering what dinosaurs eat, check out Archimedes Notebook for ideas. Just in time for this year's elections: a book of political intrigue, dirty tricks, and lacrosse. Thirteen-year-old Clayton Stone is busy prepping for the lacrosse play-offs. His school, Master's Academy, stands a chance - if they can beat Sydney Brown. Then he's recruited to go undercover to protect the President's son. At Sydney Brown school. That means working his way onto the team so he can stay close to POTUS JR. And that means playing against his own team on the play-offs. No sooner does he show up at Sydney Brown, than the school is put on lock down. It's a regular drill, but how's the new kid to know? Now he's on the "watch out for" list... and the President's son makes a point to avoid him. Not only that, it's election season, and the students are voting for next year's student leaders. The school presidential debate is coming up (yes!) and someone is stealing voters. A plucky school reporter is hot on the story and wrangles Clayton into helping. The plot thickens when a senator's son (who is an overbearing bully) engages in dirty tricks and Clayton suspects the dastardly deeds at school extend all the way to Capital Hill. As Clayton prepares for the lacrosse play-offs he tries to determine the end-game. A fun read - perfect for this season of debates. 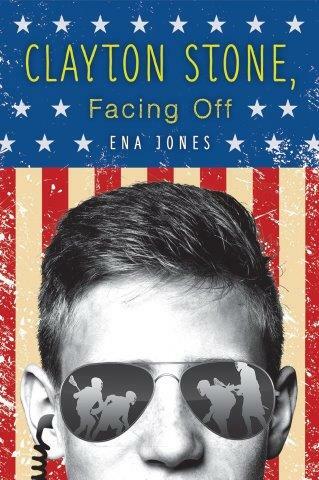 Check out this awesome interview with Ena Jones over at the Mixed Up Files.